Commission Decision 2006/679/EC of 28 March 2006 concerning the technical specification for interoperability relating to the control-command and signalling subsystem of the trans-European conventional rail system (2) laid down the technical specifications for interoperability (‘TSI’) relating to the control-command and signalling subsystem of the trans-European conventional rail system. Commission Decision 2006/860/EC of 7 November 2006 concerning a technical specification for interoperability relating to the control-command and signalling subsystem of the trans-European high speed rail system (3) lays down the TSI relating to the control-command and signalling subsystem of the trans-European high-speed rail system. The essential requirements for both the conventional and the high-speed networks must be identical, as must their functional and technical specifications, their interoperability constituents and interfaces, and the procedures for assessing the conformity or the suitability for use of the interoperability constituents or the ‘EC’ verification of their control-command and signalling subsystems. The implementation strategies should remain specific to each type of network and the existing requirements for the conventional trans-European network and for the high-speed trans-European network should remain unchanged. The European railway agency (‘Agency’) was given a framework mandate to perform certain activities. On 31 January 2011 the Agency gave its recommendation on the technical specification for interoperability relating to the subsystems ‘control-command and signalling’ of the trans-European rail system (4). This Decision is based on that recommendation. In the interest of clarity, Decisions 2006/679/EC and 2006/860/EC should therefore be replaced by this Decision. The changes introduced regarding safety requirements (Section 4.2.1 of Annex III) are based on the analysis that the text in the CCS TSIs in force leaves room for interpretations. The introduced changes have no negative impact in the overall safety level. The fitting of ERTMS/ETCS should be mandatory in the case of new installations or upgrade of the train protection part of a CCS assembly for railway infrastructure projects benefiting from EU financial support. Such fitting should in principle be carried out in the frame of the EU funded project. In certain cases, it is however necessary to grant a derogation to this implementation rule. The scope of such derogation is limited to the implementation strategy of the ‘control-command and signalling TSI’. The Agency has listed in the technical document ‘List of CCS Class B systems’ the national legacy control-command and signalling systems (‘Class B systems’). Those systems may still be requested on board locomotives and traction units to run on certain lines. The Class B systems significantly hamper the interoperability of locomotives and traction units but play an important role in maintaining the high level of safety of the trans-European network. For this reason, it is important to avoid creating additional obstacles to interoperability by, for example, altering these national legacy systems or by introducing new systems. To avoid creating additional obstacles to interoperability, Member States should ensure that the functionality of the legacy Class B systems and their interfaces remain as currently specified, except where modifications are needed to mitigate safety-related flaws in these systems. Member States should also ensure that systems not included in the list of Class B systems do not constitute additional barriers to interoperability. The availability of the GSM-R frequencies is essential for safe and interoperable railway operations. Decisions 2006/679/EC and 2006/860/EC should therefore be repealed. 1. The technical specification for interoperability (‘TSI’) relating to the ‘track-side control-command and signalling’ subsystem and ‘on-board control-command and signalling subsystems’ of the trans-European rail system, as set out in Annex III, is adopted. 2. The TSI set out in Annex III to this Decision shall apply to the track-side control-command and signalling subsystem as described in point 2.3 and to the on-board control-command and signalling subsystem as described in point 2.4 of Annex II to Directive 2008/57/EC. 1. Member States shall ensure that, whenever a national protection control-command system is requested on board rolling stock to run on a given line or part of the trans-European network, this system is included in the list of Class B systems, having equal legal value as annexes to the TSI. 2. Member States shall ensure that the functionality, performance and interfaces of the Class B systems remain as currently specified, except where modifications are needed to mitigate safety-related flaws in those systems. If these elements have already been notified in the context of Decisions 2006/679/EC and 2006/860/EC this obligation is considered fulfilled. the time by which the section of the line is connected to another ETCS equipped line. 2. The Member State concerned shall forward a file concerning the project to the Commission. This file shall contain an economic analysis showing that there is a substantial economic and/or technical advantage in putting ERTMS into service at the earlier of the two dates mentioned in paragraph 1 rather than during the course of the EU-funded project. 3. The Commission shall examine the file sent to it and the measures proposed by the Member State and shall notify the results of its examination to the Committee referred to in Article 29 of Directive 2008/57/EC. If a derogation is granted, the Member State shall ensure that ERTMS is installed before the earlier of the two dates mentioned in paragraph 1. Table 10 in Section 4.3.4 is replaced by Annex II to this Decision. The ERA technical document ERTMS/ETCS System Requirement Specification (SRS), document reference ‘subset-026’ in version 3.2.0, dated 22 December 2010, can be used as a basis to tender the equipment of lines with ETCS and to carry out tests, but before the entry into force of the so-called baseline 3, the fitment of trains with baseline 3 cannot be requested. Decisions 2006/679/EC and 2006/860/EC are hereby repealed. Their provisions shall however continue to apply in relation to maintenance of projects authorised in accordance with the TSIs annexed to those Decisions and, unless the applicant requests to apply this Decision, to projects for new, renewed or upgraded subsystems which are at an advanced stage of development or the subject of a contract in course of performance at the date of notification of the present Decision. This Decision shall apply 6 months after its notification to the Member States. Done at Brussels, 25 January 2012. (2) OJ L 284, 16.10.2006, p. 1. (3) OJ L 342, 7.12.2006, p. 1. (5) OJ L 139, 26.5.2011, p. 1. The set of rolling stock characteristics for compatibility with train detection target systems are given in clauses 4.2.3.3.1.1, 4.2.3.3.1.2 and 4.2.3.3.1.3. The set of characteristics the rolling stock is compatible with shall be recorded in the rolling stock register as defined in clause 4.8 of this TSI. The maximum distance between two consecutive axles is specified in the specification referenced in clause 3.1.2 of Annex A, Index 77 of CCS TSI (distance ai in Figure 1). The maximum distance between buffer end and first axle is specified in the specification referenced in clause 3.1.2 of Annex A, Index 77 of CCS TSI (distance b1 in Figure 1). The minimum axle load in all load conditions is specified in the specification referenced in clause 3.1.7 of Annex A, Index 77 of CCS TSI. The electrical resistance between the running surfaces of the opposite wheels of a wheelset is specified in the specification referenced in clause 3.1.9 of Annex A, Index 77 of CCS TSI and the method to measure is specified in the same clause. For electric units equipped with a pantograph, the minimum impedance between pantograph and each wheel of the train is an open point in the specification referenced in clause 3.2.2 of Annex A, Index 77 of CCS TSI. The limitations of use of sanding equipment are given in the specification referenced in clause 3.1.4 of Annex A, Index 77 of CCS TSI. The limitations of use of composite brake blocks are given in the specification referenced in clause 3.1.6 of Annex A, Index 77 of CCS TSI. The requirements related to electromagnetic compatibility are open points in the specification referenced in clauses 3.2.1 and 3.2.2 of Annex A, Index 77 of CCS TSI. The electromagnetic interference limit levels rising from traction currents are an open point in the specification referenced in clause 3.2.2 of Annex A, Index 77 of CCS TSI. The maximum distance between two consecutive axles is specified in the specification referenced in clause 3.1.2, Annex A, Index 77 of CCS TSI. The minimum distance between two consecutive axles of the train is specified in the specification referenced in clause 3.1.2, Annex A, Index 77 of CCS TSI. At the end of a unit intended to be coupled, the minimum distance between end and first axle of the unit is half of the value specified in the specification referenced in clause 3.1.2, Annex A, Index 77 of CCS TSI. The maximum distance between end and first axle is specified in the specification referenced in clause 3.1.2, Annex A, Index 77 of CCS TSI (distance b1 in Figure 1). The minimum distance between end axles of a unit is specified in the specification referenced in clause 3.1.2, Annex A, Index 77 of CCS TSI. Wheel geometry is specified in the clause 4.2.3.5.2.2 of the present TSI. The minimum wheel diameter (speed dependant) is specified in the specification referenced in clause 3.1.3, Annex A, Index 77 of CCS TSI. The metal-free space around wheels is an open point in the specification referenced in clause 3.1.3.5, Annex A, Index 77 of CCS TSI. The characteristics of the wheel material regarding magnetic field is specified in the specification referenced in clause 3.1.3.6, Annex A, Index 77 of CCS TSI. The requirements related to electromagnetic compatibility are specified in the specification referenced in clauses 3.2.1 and 3.2.2 of Annex A, Index 77 of CCS TSI. The electromagnetic interference limit levels rising from the use of eddy current or magnetic track brakes are an open point in the specification referenced in clause 3.2.3 of Annex A, Index 77 of CCS TSI. This TSI concerns the Control-Command and Signalling On-board Subsystem and the Control-Command and Signalling Track-side Subsystem. The geographical scope of this TSI is the trans-European rail system, i.e. 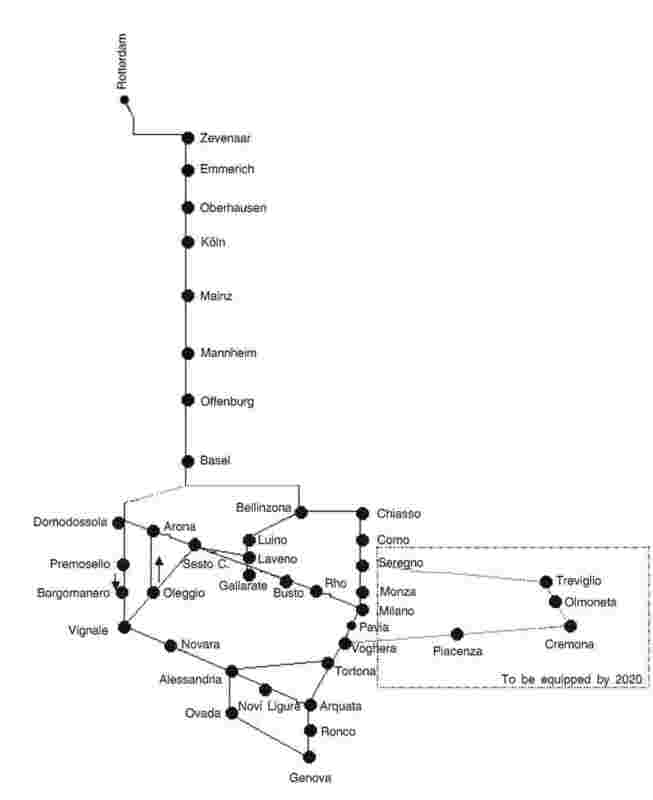 the trans-European conventional and high-speed rail systems as set out in points 1 and 2 of Annex I to Directive 2008/57/EC (Railway Interoperability Directive). In accordance with Article 5(5) of the Railway Interoperability Directive, provisions for specific cases are indicated in Chapter 7 (Implementing the Control-Command and Signalling Subsystems TSI). The Control-Command and Signalling Subsystems are defined in Annex II to the Railway Interoperability Directive as ‘all the equipment required to ensure safety and to command and control movements of trains authorised to travel on the network’. The Control-Command and Signalling Subsystems TSI specifies only those requirements which are necessary to assure the interoperability of the trans-European rail system and compliance with the essential requirements. The Class A train protection system is ERTMS/ETCS whilst the Class A radio system is GSM-R.
Class B systems are a limited set of train protection legacy control-command and signalling systems that were in use before 20 April 2001. The list of Class B systems is established in the European Railway Agency technical document ‘List of CCS Class B systems’, ERA/TD/2011-11, version 1.0. The interfaces specified by this TSI define the means of data transmission to, and (where appropriate) from trains. The ERTMS/ETCS specifications referenced by this TSI provide application levels from which a track-side implementation may choose the means of transmission that meet its requirements. a train equipped with Class A on-board train protection for level 1 need not be equipped with a GSM-R data radio but must already implement all level 2 functions so as to ensure that the mere connection of a GSM-R data radio at a later stage will ensure it is equipped for level 2. The Railway Interoperability Directive requires that the subsystems and the interoperability constituents including interfaces meet the essential requirements set out in general terms in Annex III to the Directive. Every project to which this specification is applied shall take the measures necessary to ensure that the level of risk of an incident occurring within the scope of the Control-Command and Signalling Subsystems, is not higher than the objective for the service. For this purpose Commission Regulation (EC) No 352/2009 of 24 April 2009 on the adoption of a common safety method on risk evaluation and assessment as referred to in Article 6(3)(a) of Directive 2004/49/EC of the European Parliament and of the Council (2) (Common Safety Method) applies. To ensure that the measures taken to achieve safety do not jeopardise interoperability, the requirements of the basic parameter defined in Section 4.2.1 (Control-Command and Signalling safety characteristics relevant to interoperability) shall be respected. For the ERTMS/ETCS Class A system the safety objective is apportioned between the Control-Command and Signalling On-board and Track-side Subsystems. The detailed requirements are specified in the basic parameter defined in Section 4.2.1 (Control-Command and Signalling safety characteristics relevant to interoperability). This safety requirement must be met together with the availability requirements as defined in Section 3.2.2 (Reliability and Availability). For the Class A system, the reliability and availability objectives are apportioned between the Control-Command and Signalling On-board and Track-side Subsystems. The detailed requirements are specified in the basic parameter defined in Section 4.2.1 (Control-Command and Signalling safety characteristics relevant to interoperability). The level of risk shall be monitored as constituents of the subsystem age and wear. The requirements for maintenance stated in Section 4.5 shall be respected. In accordance with EU regulations and with national regulations that are compatible with the European legislation, care shall be taken to ensure that the materials used in and the design of the Control-Command and Signalling Subsystems do not constitute a health hazard to persons having access to them. The second category describes how the Control-Command and Signalling Subsystems have to be applied technically and what functions they have to perform to ensure interoperability. This category is defined in Chapter 4. The third category describes how the Control-Command and Signalling Subsystems have to be operated in order that interoperability is achieved. This category is defined in Chapter 4. Control-Command and Signalling equipment shall be capable of operating under the climatic and physical conditions which characterise the area in which the relevant part of the trans-European rail system is located. The requirements of basic parameter 4.2.16 (Environmental conditions) shall be respected. In accordance with EU regulations and with national regulations that are compatible with the European legislation, the Control-Command and Signalling equipment shall neither interfere with nor be interfered with by other control-command and signalling equipment or other subsystems. The basic parameter related for electromagnetic compatibility between rolling stock and control-command and signalling track-side equipment is described in Section 4.2.11 (Electromagnetic Compatibility). 3.2.5.2. Control-Command and Signalling Compatibility. In addition, where the Control-Command and Signalling Subsystems are concerned, this TSI ensures technical interoperability between trans-European high-speed rail and conventional rail systems when both are fitted with Class A systems. All requirements in Section 4.2 (Functional and technical specifications of the Subsystems) to meeting these basic parameters shall be applied to the Class A system. for the Control-Command and Signalling Track-side Subsystem, track-to-train and train-to-track communication are fully standardised in this TSI. The specifications referenced in the sections below allow Control-Command and Signalling track-side functionality to be applied in a flexible way, so that it can be optimally integrated into the railway system. This flexibility shall be exploited without limiting the movement of TSI-compliant on-board subsystems. The Control-Command and Signalling functions are classified in categories indicating whether they are optional (O) or mandatory (M). The categories are defined in Annex A 4.1a for ERTMS/ETCS and Annex A 4.1b for GSM-R and these texts also state how the functions are classified. Annex A 4.1c provides the Glossary of ERTMS/ETCS terms and definitions, which are used in the specifications referred to in Annex A. According to Section 2.2 (Scope) the Control-Command and Signalling Subsystems include three parts. With respect to the essential requirements set out in Chapter 3, the functional and technical specifications of the Control-Command and Signalling Subsystems are as follows. This basic parameter describes the requirements for the Control-Command and Signalling On-board Subsystem and Track-side subsystem with reference to Section 3.2.1 (Safety) and Section 3.2.2 (Availability and Reliability). The requirements set out in Sections 4.2.1.1 and 4.2.1.2 below shall be respected. The Control-Command and Signalling On-board and Track-side subsystems shall respect the requirements for ERTMS/ETCS equipment and installations stated in this TSI. For the hazard ‘exceeding speed and/or distance limits advised to ERTMS/ETCS’ the tolerable rate (THR) is 10– 9 h– 1 for random failures, for on-board ERTMS/ETCS and for track-side ERTMS/ETCS. See Annex A 4.2.1.a. To achieve interoperability, the on-board ERTMS/ETCS shall fully respect all requirements specified in Annex A 4.2.1. Nevertheless, less stringent safety requirements are acceptable for track-side ERTMS/ETCS provided that, in combination with TSI-compliant Control-Command and Signalling On-board subsystems, the safety level for the service is met. Requirements for hazards related to errors at the interface between driver and on-board ERTMS/ETCS are an open point. The Control-Command and Signalling On-board and Track-side subsystems shall respect the requirements stated in this TSI. The availability/reliability requirements are defined in Annex A 4.2.1.b. The level of risk shall be controlled during the life of the assemblies. The requirements for maintenance stated in Section 4.5 (Maintenance rules) shall be respected. These functions shall be implemented in accordance with Annex A 4.2.2.b and their performance shall conform to Annex A 4.2.2.a. The requirements for tests are specified in Annex A 4.2.2.c. The ETCS identities of equipment shall be managed in accordance with Section 4.2.9 (ETCS-ID management). Communication with the Control-Command and Signalling Track-side Subsystem. Radio data transmission. See Section 4.2.5.1 (Radio communications with the train), Section 4.2.6.2 (Interface between GSM-R Radio Data Communication and ERTMS/ETCS) and Section 4.2.8 (Key Management). Only mandatory on-board for ERTMS/ETCS Level 2 or ETCS Level 3 applications. Communicating with the driver. See Annex A 4.2.2.e and Section 4.2.12 (ERTMS/ETCS DMI). isolating the on-board ERTMS/ETCS functionality. Support data recording for regulatory purposes. See Section 4.2.14 (Interface to Data Recording for Regulatory Purposes). to/from the train interface unit. See Annex A 4.2.2.f. This Basic parameter describes the ERTMS/ETCS track-side functionality. It contains all ERTMS/ETCS functionality to provide a safe path to a specific train. These functions shall be implemented in accordance with Annex A 4.2.3.b and their performance shall conform to Annex A 4.2.3.a. The requirements for tests are specified in Annex A 4.2.3.c. Radio data transmission. See Section 4.2.5.1 (Radio communications with the train), Section 4.2.7.3 (GSM-R/track-side ETCS functionality) and Section 4.2.8 (Key Management). Radio data transmission is only relevant to levels 2 and 3. Generating information/orders to the on-board ERTMS/ETCS, e.g. information related to closing/opening the air flaps, lowering/raising the pantograph, opening/closing the main power switch, changing from traction system A to traction system B. Implementation of this functionality is optional for track-side. Managing the transitions between areas supervised by different Radio Block Centres (RBCs) (only relevant for levels 2 and 3). See Section 4.2.7.1 (Functional interface between RBCs) and Section 4.2.7.2 (Technical interface between RBCs). This basic parameter describes the radio communication functions. Such functions shall be implemented in the Control-Command and Signalling On-board and Track-side subsystems, according to the specifications indicated below. The general requirements are specified in Annex A 4.2.4.a. 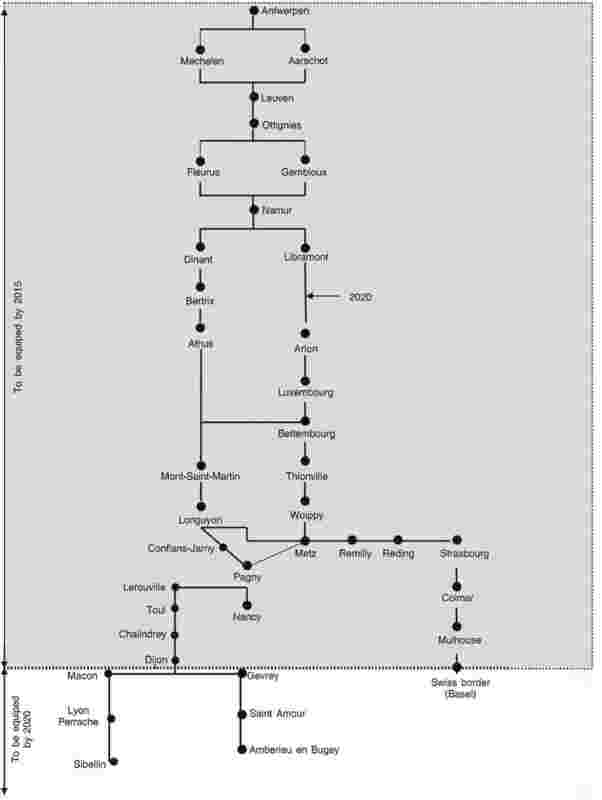 location-dependent addressing; Annex A 4.2.4.e. The general requirements are defined in Annex A 4.2.4.f. The requirements for tests are specified in Annex A 4.2.4.g. presentation of functional numbers; Annex A 4.2.4.k. This functionality is mandatory only in the case of ETCS levels 2 and 3 and radio in-fill applications. This basic parameter specifies the requirements for the air gap between Control-Command and Signalling Track-side and On-board subsystems and has to be taken into account in conjunction with the requirements for the interfaces between ERTMS/ETCS and GSM-R equipment, as specified in Section 4.2.6 (On-board Interfaces Internal to Control-Command and Signalling) and Section 4.2.7 (Track-side Interfaces Internal to Control-Command and Signalling). Class A radio communication interfaces shall operate in the GSM-R Band – see Annex A 4.2.5.a. The protocols shall comply with Annex A 4.2.5.b. Where radio in-fill is implemented, the requirements stated in Annex A 4.2.5.c shall be respected. Eurobalise communication interfaces shall comply with Annex A 4.2.5.d. Euroloop communication interfaces shall comply with Annex A 4.2.5.e. Where ERTMS/ETCS and Class B train protection functions are installed on-board, the transitions between them can be managed with a standardised interface as specified in Annex A 4.2.6.a. Annex A 4.2.6.b specifies the K-interface (to allow certain STMs to read information from Class B balises through the ERTMS/ETCS on-board antenna) and Annex A 4.2.6.c the G interface (air gap between ETCS on-board antenna and Class B balises). Implementation of Interface ‘K’ is optional, but if done it must be in accordance with Annex A 4.2.6.b. Furthermore, if Interface ‘K’ is implemented, the on-board transmission channel functionality must be able to handle the properties of Annex A 4.2.6.c. If the transitions between ERTMS/ETCS and Class B train protection on-board are not managed using the standardised interface specified in Annex A 4.2.6.a, steps must be taken to ensure that the method used does not impose any additional requirements on the Control-Command and Signalling Track-side Subsystem. The requirements for the interface between the Class A radio and the on-board ERTMS/ETCS functionality are specified in Annex A 4.2.6.d. Where radio in-fill is implemented the requirements stated in Annex A 4.2.6.e shall be respected. The interface between the odometry function and on-board ETCS shall meet the requirements of Annex A 4.2.6.f. This interface contributes to this Basic Parameter only when odometry equipment is supplied as a separate interoperability constituent (see Section 5.2.2, Grouping of interoperability constituents). The requirements are specified in Annex A 4.2.7.a. This is the technical interface between two RBCs. The requirements are specified in Annex A 4.2.7.b. This is the interface between the Class A radio system and the track-side ETCS functionality. The requirements are specified in Annex A 4.2.7.c. This is the interface between Eurobalise and the LEU. The requirements are specified in Annex A 4.2.7.d. This interface contributes to this basic parameter only when Eurobalise and LEU are supplied as separate interoperability constituents (see Section 5.2.2, Grouping of interoperability constituents). This is the interface between Euroloop and the LEU. The requirements are specified in Annex A 4.2.7.e. This interface contributes to this Basic Parameter only when Euroloop and LEU are supplied as separate interoperability constituents (see Section 5.2.2, Grouping of interoperability constituents). The requirements are specified in Annex A 4.2.8.a. Only requirements related to the interfaces of Control-Command and Signalling equipment fall within the scope of this TSI. This basic parameter concerns the ETCS-identities (ETCS-IDs) for equipment in Control-Command and Signalling Track-side and On-board Subsystems. The requirements are specified in Annex A 4.2.9.a. This basic parameter specifies the interface requirements between the track-side train detection systems and rolling stock. The interface requirements to be respected by the train detection systems are specified in Annex A 4.2.10.a. This basic parameter specifies the interface requirements for electromagnetic compatibility between rolling stock and track-side Control-Command and Signalling equipment. This basic parameter describes the information provided from ERTMS/ETCS to the driver and entered into the on-board ERTMS/ETCS by the driver. See Annex A 4.2.12.a. ERTMS/ETCS functions triggered by driver input. This basic parameter describes the information provided from GSM-R to the driver and entered into the GSM-R on-board by the driver. See Annex A 4.2.13.a. In addition, the installation of track-side Control-Command and Signalling objects shall be compatible with the driver’s field of view and the infrastructure requirements. The environmental conditions mandated in the specifications referenced in this TSI shall be respected. The rules for operating a railway service with ERTMS/ETCS are specified in the Traffic Operation and Management TSI. The manufacturers of the equipment and of the subsystem shall provide information sufficient to define the professional competences required for the installation, final inspection and maintenance of the Control-Command and Signalling Subsystems. See Section 4.5 (Maintenance rules). Care shall be taken to ensure health and safety for maintenance and operations staff, in accordance with EU regulations and the national regulations that are compatible with the European legislation. Manufacturers shall indicate the risks for health and safety that arise from using and maintaining their equipment and subsystems. See Section 4.4 (Operating rules) and Section 4.5 (Maintenance rules). The data to be provided for the registers provided for in Articles 34 and 35 of Directive 2008/57/EC are those indicated in Commission Implementing Decision 2011/665/EU (3) and Commission Implementing Decision 2011/633/EU (4). Table 5.2.a for the Control-Command and Signalling Track-side Subsystem. Table 5.2.b lists the groups of interoperability constituents of the Control-Command and Signalling Track-side Subsystem. in column 4, the mandatory specifications for the conformity assessment of each function or interface (where applicable) by reference to the relevant section of Chapter 4.
verifying the subsystems (see Section 6.3). specific cases described in Section 7.2.9. In such cases, assessment of conformity with those rules shall be carried out under the responsibility of the Member States concerned according to notified procedures. A Control-Command and Signalling On-board Subsystem covered by an ‘EC’ declaration of verification should be able to run on every Control-Command and Signalling Track-side Subsystem covered by an ‘EC’ Declaration of verification, under the conditions specified in this TSI, with no additional verifications. test specifications to prove that the Control-Command and Signalling On-board and Track-side Subsystems comply with the requirements of this TSI and are mutually compatible. shall, unless otherwise specified in Annex A 4.2.2.c, cover at least the start of mission, the transition between levels, transition between modes that may be used on the line, the main identified degraded situations, the sending of emergency messages and any other relevant aspects specific to the line. shall use the abovementioned data base to assess whether further mandatory test specifications are needed and whether it is necessary to draw up additional engineering rules for the Control-Command and Signalling On-board and Track-side subsystems. Before placing on the market an interoperability constituent and/or groups of interoperability constituents the manufacturer or his authorised representative established within the European Union shall draw up an ‘EC’ declaration of conformity in accordance with Article 13(1) and Annex IV to the Railway Interoperability Directive. The assessment procedure shall be carried out using one of the modules specified in Section 6.2.2 (Modules for Control-Command and Signalling Interoperability Constituents). An ‘EC’ declaration of suitability for use is not required for Control-Command and Signalling interoperability constituents, because they have to fully comply with all the relevant basic parameters. This compliance is demonstrated by the ‘EC’ Declaration of conformity and is sufficient for placing them on the market (5). The modules are described in detail in Commission Decision 2010/713/EU of 9 November 2010 on modules for the procedures for assessment of conformity, suitability for use and ‘EC’ verification to be used in the technical specifications for interoperability adopted under Directive 2008/57/EC of the European Parliament and of the Council (6). with reference to Chapter 3 of the ‘Module CF’ (product verification) statistical verification is not allowed, i.e. all interoperability constituents must be individually examined. the development process is able to detect and eliminate systematic failures. The manufacturer’s quality and safety management throughout design, manufacturing and testing conforms to a recognised standard (see Note). The software development life-cycle, the hardware development life-cycle and the integration of hardware and software have each been undertaken in accordance with a recognised standard (see Note). The safety verification and validation process has been undertaken in accordance with a recognised standard (see Note) and respects the safety requirements described in the basic parameters referenced in the relevant table of Chapter 5. The functional and technical safety requirements (correct operation under fault-free conditions, effects of faults and of external influences) are verified in accordance with a recognised standard (see Note). See Annex A, Table A 3. Particular attention shall be given to assessing the conformity of the on-board ERTMS/ETCS interoperability constituent, since it is complex and plays a key role in achieving interoperability. Regardless of whether module CB or CH1 is chosen, the Notified Body shall check that a specimen of the interoperability constituent has passed the full set of mandatory test sequences referenced in Section 4.2.2 (on-board ERTMS/ETCS functionality) and that these tests were carried out in a laboratory accredited to carry out this type of tests in accordance with Regulation (EC) No 765/2008 of the European Parliament and of the Council of 9 July 2008 setting out the requirements for accreditation and market surveillance relating to the marketing of products and repealing Regulation (EEC) No 339/93 (7). In addition, to increase confidence that the on-board ERTMS/ETCS can be correctly operated with different track-side applications, it is recommended that the on-board ERTMS/ETCS be tested using scenarios from the data base managed by the Agency and which are not part of the mandatory test specifications; see Section 6.1.2 (Principles for testing ERTMS/ETCS and GSM-R). The documentation accompanying the certificate shall indicate the database scenarios against which the interoperability constituent has been checked. Verification of the STM interface to the on-board ERTMS/ETCS requires a conformity assessment carried out by a Notified Body. This chapter deals with the ‘EC’ declaration of verification for the Control-Command and Signalling On-board Subsystem and the ‘EC’ declaration of verification for the Control-Command and Signalling Track-side Subsystem. At the request of the applicant the Notified Body shall carry an ‘EC’ verification of a Control-Command and Signalling On-board or Track-side Subsystem in accordance with Annex VI to the Railway Interoperability Directive. The applicant shall draw up the ‘EC’ declaration of verification for the Control-Command and Signalling On-board or Track-side Subsystem in accordance with Article 18(1) and Annex V to the Railway Interoperability Directive. The content of the ‘EC’ declaration of verification shall conform to Annex V to the Railway Interoperability Directive. The assessment procedure shall be carried out by using one of the modules as specified in Section 6.3.2 (Modules for Control-Command and Signalling Subsystems). The ‘EC’ declarations of verification for a Control-Command and Signalling On-board Subsystem and of a Control-Command and Signalling Track-side Subsystem, together with the certificates of conformity, shall be deemed sufficient to ensure that the subsystems are compatible under the conditions specified in this TSI. All modules indicated below are specified in the Decision 2010/713/EU. With reference to Section 4.2 of Module SB (type-examination), design review is requested. With reference to Section 4.2 of Module SH1 (full quality management system with design examination), a type test is required. the functionality and performances of interoperability constituents already covered by their EC Declaration of conformity do not require additional verifications. the signalling data and rules to be handled by the ERTMS/ETCS system. functionality and performances that have already been checked at the level of the interoperability constituents do not require additional verification. Reports of tests of the operational scenarios specified in Section 6.1.2 with different certified Control-Command and Signalling On-board Subsystems. The report shall indicate which operational scenarios have been tested, which on-board equipment has been used and whether tests have been performed in laboratories, test lines or real implementation. Note: Indicate in the certificate which conditions have been tested, which standards have been applied and the criteria for considering the tests terminated. Pursuant to Article 18(4) of the Railway Interoperability Directive, ‘the Notified Body may issue Intermediate Statement Verifications (ISVs) to cover certain stages of the verification procedure or certain parts of the subsystem’. As pointed out in Section 2.2 (Scope) of this TSI, the Control-Command and Signalling Subsystems include three parts, which are specified in Section 4.1 (Introduction). Section 6.4.2 deals with the verification of these parts of the Control-Command and Signalling Subsystems. Section 6.4.3 deals with the verification of partial conformity of Control-Command and Signalling Subsystems when there are restricted conditions of use of its interoperability constituent(s). Assessing whether a Control-Command and Signalling Track-side or On-board Subsystem complies with the requirements of this TSI is a process that may be performed in successive steps – one for each of the three parts. At each step, the assessor checks only whether that particular part complies with the TSI requirements. the TSI requirements already assessed are not prejudiced. Functions already assessed and unchanged and which are not affected by this step do not need to be checked again. the RBC interface to other RBCs, if the RBC is intended for use in an application where no neighbouring RBCs are planned. The certificate indicates which functions, interfaces or performance are not implemented and states the corresponding restrictions on the use of the interoperability constituent. This information will make it possible to identify the conditions under which the interoperability constituent can be used and the restrictions that will apply to the interoperability of a subsystem incorporating it. In any event, the conditions for issuing such certificates with restrictions shall be coordinated between the Notified Bodies and the Agency in a working group set up pursuant to Article 21a(5) of Regulation (EC) No 881/2004 of the European Parliament and of the Council of 29 April 2004 establishing a European Railway Agency (Agency Regulation) (10). When the interoperability constituent is integrated into a Control-Command and Signalling On-board or Track-side Subsystem, if the missing functions, interfaces, or performances do not allow to assess whether the subsystem fully complies with the requirements of this TSI, only an Intermediate Statement of Verification may be issued. It shall indicate which requirements have been assessed and shall state the corresponding restrictions on the use of the subsystem and its compatibility with other subsystems. If lines that fall within the scope of this TSI are not equipped with Class A train protection systems, the Member State shall make every effort to ensure the availability of an external Specific Transmission Module (STM) for its legacy Class B train protection system or systems. In this context, due regard is to be given to ensuring an open market for STMs under fair commercial conditions. If, for technical or commercial reasons (11) the availability of an STM cannot be ensured, the Member State concerned shall inform the Committee of the underlying reasons for the problem and of the mitigation measures that it intends to put into place in order to allow operators — and in particular foreign operators — access to its infrastructure. On a line equipped with ERTMS/ETCS and/or GSM-R, additional Class B equipment may be installed in order to allow the operation of rolling stock not compatible with Class A during the migration phase. Class B equipment may be used on-board as a fallback arrangement for a Class A system. However an infrastructure manager is not entitled to require the interoperable trains running on such a line to have Class B systems on board. In addition, track-side shall support transitions between Class A and Class B without imposing on the Control-Command and Signalling On-board Subsystem requirements additional to those specified in this TSI. The Member State concerned may restrict the use of an on-board Class B system on lines where the corresponding system is not installed track-side. When running on a line which is equipped with both Class A and Class B systems, a train that is also equipped with both Class A and Class B systems may use the Class B systems as a fallback arrangement. This cannot be a requirement for interoperability. independently from the ERTMS/ETCS equipment, for example via a system that enables switching between equipment. The Railway Undertaking must then ensure that the transitions between Class A and Class B train protection are carried out in conformity with the requirements of this TSI and with the national rules for the Class B system. Depending on the characteristics of the Control-Command and Signalling Track-side Sub-system and its interfaces with other sub-systems, some track-side functionalities not classified as mandatory may necessarily have to be implemented in certain applications to comply with the essential requirements. an on-board assembly, which incorporates a KER STM, may make it necessary to implement the K-interface. upgrading the radio part of a Control-Command and Signalling Track-side Subsystem already in service in such a way that it changes the functions or the performance of the subsystem. This does not include the modifications deemed necessary to mitigate safety-related defects in the legacy installation. upgrading the radio part of a Control-Command and Signalling On-board Subsystem already in service in such a way that it changes the functions or the performance of the subsystem. This does not apply to modifications deemed necessary to mitigate safety-related defects in the legacy installation. In the context of this TSI, train detection system means the equipment installed track-side, which detects the presence or absence of vehicles either on an entire line of route or on a local section of it. Track-side systems (e.g. interlocking or level crossing control systems) which use information from detection equipment are not considered parts of the train detection system. This TSI specifies the requirements for the interface with rolling stock only to the extent necessary to ensure compatibility between TSI-compliant rolling stock and the infrastructure. Implementing a train detection system that is compliant with the requirements of the Control-Command and Signalling Subsystems TSI can be done independently of the installation of ERTMS/ETCS or GSM-R, but can be dependent on the Class B signalling systems or on special requirements, e.g. for level crossing equipment. removing Class B train protection systems (where the train detection and train protection systems are integrated). In the migration phase care shall be taken to ensure that installing a TSI compliant train detection system has a minimal negative impact on the existing non-TSI compliant rolling stock. To achieve this, it is recommended that the Infrastructure Manager selects a TSI compliant train detection system that, at the same time, is compatible with the non-TSI compliant rolling stock already operating on that infrastructure. The specific cases set out in Sections 7.2.9.2 to 7.2.9.7 should be read in conjunction with the relevant sections of Chapter 4 and/or specifications referenced there. Where the requirements set out in the relevant section of Chapter 4 are not subject to a specific case, those requirements have not been duplicated in Sections 7.2.9.2 to 7.2.9.7 and continue to apply unmodified. is only permitted where it can be demonstrated that at least a further six axles of the multiple unit are beyond the laying position. This specific case is needed as soon as the open point related to the DMI specification is closed. It is permissible to put in service on-board Control-Command and Signalling Subsystems including 2 Watt GSM-R voice cab radios and ETCS data only radios. The subsystems shall be able to operate in networks with - 82 dBm. This section outlines the strategy (ERTMS European Deployment Plan) for implementing the TSI. It specifies the stages to be completed in order to make a gradual transition from the existing situation to the final situation in which compliance with the TSIs shall be the norm. The ERTMS European Deployment Plan does not apply to lines located in the territory of a Member State when its rail network is separated or isolated by the sea or separated as a result of special geographical conditions or of different track gauge from the rail network of the rest of the Community. The aim of the ERTMS European Deployment Plan is to ensure that locomotives, railcars and other railway vehicles equipped with ERTMS can gradually have access to an increasing number of lines, ports, terminals and marshalling yards without needing national equipment in addition to ERTMS. This does not mean that existing Class B systems have to be removed from the lines included in the plan. However, by the date specified in the implementation plan, locomotives, railcars and other railway vehicles equipped with ERTMS must be given access to lines included in the deployment plan without requiring those vehicles to be equipped with a Class B system. Terminal areas such as ports, or specific lines in a port, which are not equipped with a Class B system fulfil the requirements set out in Section 7.3.2.2 provided railway vehicles are given access to these terminal areas without any requirement as regards equipment with an Automatic Train Protection system being imposed. A line consisting of two or more tracks shall be considered equipped as soon as two of the tracks are equipped so as to allow traffic in both directions. When there is more than one line on a section of a corridor, at least one of the lines on this section must be equipped and the whole corridor shall be considered equipped as soon as at least one line is equipped over the whole length of the corridor. The six corridors described in Section 7.3.4 shall be equipped with ERTMS according to the timetable indicated in that section (12). The ports, marshalling yards, freight terminals and freight transport areas listed in 7.3.5 shall be linked to at least one of the six corridors specified in 7.3.4 at the date and under the conditions specified in 7.3.5.
upgrading the existing train protection part of a Control-Command and Signalling Track-side Subsystem, where this would change the functions, performance and/or interoperability-relevant interfaces (air gaps) of the existing legacy system. This does not apply to modifications deemed necessary to mitigate safety-related defects in the legacy installation. It is recommended that ERTMS/ETCS be installed whenever the infrastructure or energy sub-system of a section of line already in service is to be upgraded, renewed or maintained, provided the installation of ERTMS/ETCS on that section of line represents less than 10 % of the total upgrade/renewal/maintenance investment. upgrading the train protection part of a Control-Command and Signalling Subsystem already in service, where this changes the functions or the performance of the subsystem. For each corridor section described in 7.3.4, Member States shall either notify to the Commission a detailed timeline for equipping that corridor section with ERTMS or confirm that the corridor section is already equipped. The information shall be notified to the Commission no later than 3 years before the deadline for equipping that corridor section, as specified in 7.3.4. For each port, marshalling yard, freight terminal or freight transport area listed in 7.3.5, Member States shall notify the specific lines to be used to connect it with one of the corridors listed in 7.3.4. This information shall be notified to the Commission no later than 3 years before the date specified in 7.3.5 and shall indicate the deadline for equipping this port, marshalling yard, freight terminal or freight transport area. If necessary, the Commission may request adjustments, in particular to ensure consistency between equipped lines at the borders. Member States shall either notify to the Commission a detailed timeline for equipping these specific lines with ERTMS or confirm that these specific lines are already equipped. This information shall be notified to the Commission no later than 3 years before the date specified in 7.3.5 and shall indicate the deadline for equipping this port, marshalling yard, freight terminal or freight transport area. The detailed timelines shall in particular indicate the date by which the tender for equipping of the line will be concluded, the procedures put in place in order to ensure interoperability with the neighbouring countries on the corridor and the main milestones relating to the project. Every 12 months, Member States shall inform the Commission of the progress made in equipping these lines sending an updated timeline. When a Member State reasonably expects delays in fulfilling the deadlines laid down in this Decision, it shall immediately inform the Commission. It shall send the Commission a file containing a technical description of the project and an up-to-date implementation plan. The file shall also explain the reasons for the delay and shall indicate the corrective measures the Member State has taken. evidence is given that appropriate measures have been taken to minimise the additional delay. The Commission shall examine the file sent to it and the measures proposed by the Member State and shall notify the result of its examination to the committee referred to in Article 29 of Directive 2008/57/EC. New locomotives, new railcars and other new railway vehicles able to run without traction equipped with a driving cab, ordered after 1 January 2012 or put into service after 1 January 2015, shall be equipped with ERTMS. requesting that new shunting locomotives and/or other new railway vehicles equipped with a driving cab, even if designed exclusively for national service or regional border crossing service, be equipped with ERTMS. upgrading any existing train protection part of a Control-Command and Signalling On-board Subsystem, where this would change the functions, performances and/or interoperability-relevant interfaces of the existing legacy system. This does not apply to modifications deemed necessary to mitigate safety related defects in the legacy system. A link to Rotterdam shall also be provided by 2020. The connection to corridor E implies equipping the Burgas-Sofia section and the Sofia-Vidin-Calafat and Calafat-Curtici sections in Romania (PP22). Connecting this terminal implies that the Flensburg-Padborg line is chosen to be an ERTMS equipped link – see corridor B footnote. By 2020, a direct link between corridor E and corridor F (from Dresden to Hannover) shall also be ensured. The connection to Corridor E implies equipping the Kulata-Sofia section in Bulgaria. Three connections are requested. A connection to Paris via Hendaye, a connection from Pamplona to Madrid and a connection from Pamplona to corridor D via Zaragoza. 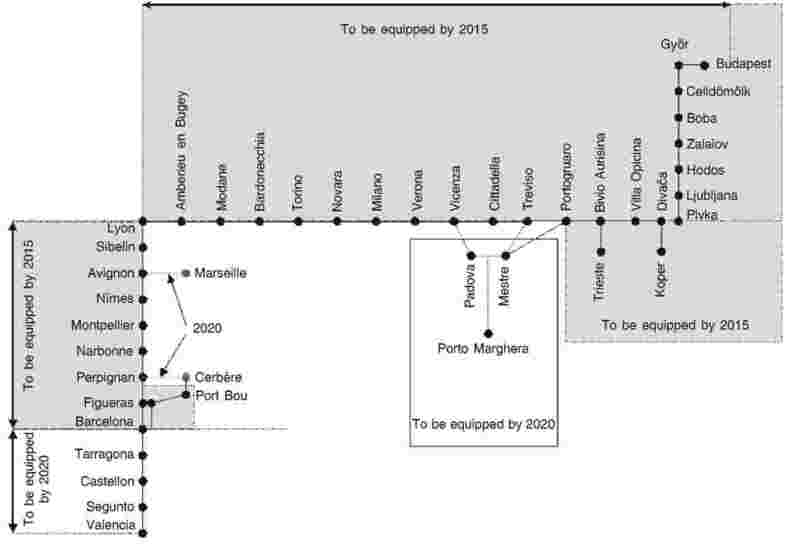 By 2020 the following connections will be provided: (i) Hendaye; (ii) Channel Tunnel; (iii) Dijon; and (iv) Metz via Epernay and Châlons-en-Champagne. A link to Antwerpen shall also be provided by 2020. 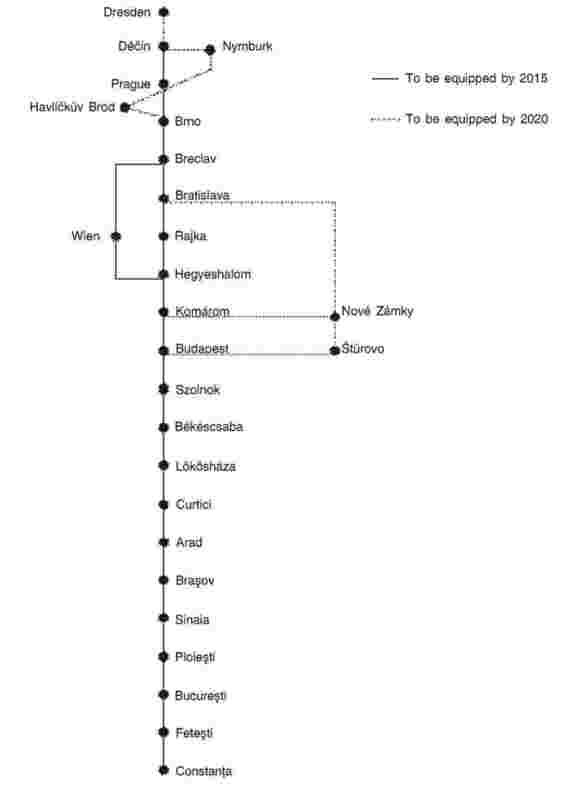 By 2020 the Wrocław-Legnica line, shall be equipped in order to ensure a direct link to the German border (Görlitz). This terminal will be connected as corridor C is extended to the Channel Tunnel. (1) Degraded modes are modes of operation designed to deal with faults. They have been taken into account when designing the Control-Command and Signalling Subsystems. (3) OJ L 264, 8.10.2011, p. 32. (4) OJ L 256, 1.10.2011, p. 1. (5) Checking that an Interoperability Constituent is used appropriately is part of the overall EC verification of Control-Command and Signalling On-board and Track-side Subsystems, as explained in 6.3.3 and 6.3.4. (6) OJ L 319, 4.12.2010, p. 1. (8) In this case, the assessment of the management of transitions shall be according to national specifications. (9) The procedures described in this Chapter do not prejudice the possibility of grouping constituents together. (10) OJ L 164, 30.4.2004, p. 1. (11) E.g. the feasibility of the external STM concept cannot be technically guaranteed or potential issues relating to the ownership of the intellectual property rights of the Class B systems prevent the timely development of an STM product. (12) Section 7.3.4 lays down the deadlines for equipping these corridors, with a view to building a consistent ERTMS network step by step. In a number of cases, there are voluntary agreements on an earlier deadline. (13) OJ L 210, 31.7.2006, p. 25. (14) OJ L 228, 9.9.1996, p. 1. (15) Without prejudice of the legislation applicable to the trans-European high-speed network, links can be provided through stretches of high-speed lines, provided paths are allocated to freight trains. At least one ERTMS-equipped link will be provided by 2020 between Denmark and Germany (Flensburg-Hamburg or Rødby-Puttgarden) but not necessarily two. The Brenner base tunnel will be equipped with ERTMS once the infrastructure work is completed (target date 2020). (16) A link between Nancy and Réding will be provided by 2020. (17) Two additional branches will be equipped by 2020: Montmélian – Grenoble – Valence and Lyon – Valence – Arles – Miramas (left bank of the Rhône). 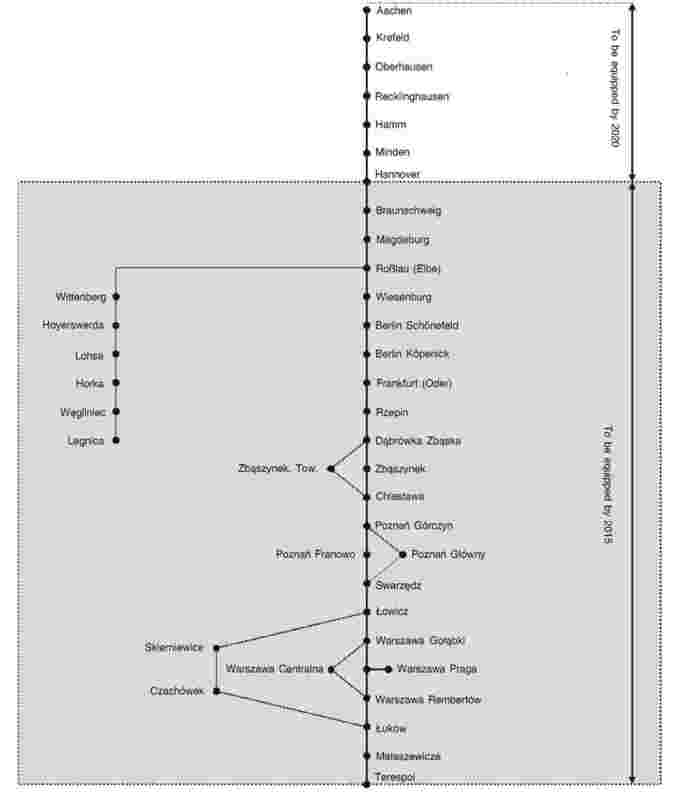 (18) Germany will do its best to equip the corridor E section from Dresden to the Czech border at an earlier date. 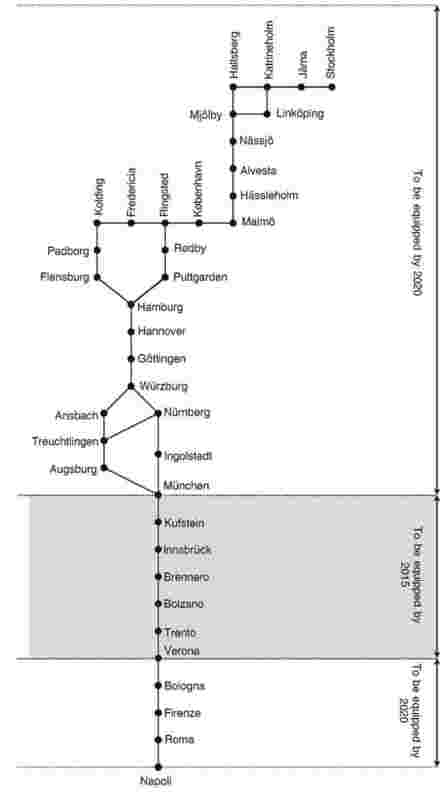 (19) Germany will equip a rail link to Hamburg but the harbour area may be only partly equipped by 2020. For each reference made in the basic parameters (Chapter 4 of this TSI) the following table indicates the corresponding mandatory specifications, via the Index in Table 2. For the purposes of applying this TSI, all specifications listed in Table A 2 below shall be legally binding in the version indicated in Table A 2. Documents referred to within a specification listed in Table A 2 shall be considered as being for information only, unless otherwise stated Table A 2. In cases where statements within the specifications listed in Table A 2 contradict the abovementioned provisions, the latter shall take precedence. specifications indicated as ‘Reserved’ in Table A 2 correspond to the open points listed in Annex G.
the specifications listed in Section 2.1 of EN 301 515 are mandatory. the change requests (CRs) listed in Tables 1 and 2 of TR 102 281 are mandatory. The standards listed in the table below shall be applied in the certification process, without prejudice for the provisions of Chapters 4 and 6 of this TSI. This open point will be solved by ERTMS/ETCS baseline 3. The harmonised braking model is already included for information purposes in Annex A, Table A 2, Index 15. Frequent occurrence of degraded situations caused by failures of Control-Command and Signalling equipment will decrease the system safety. To avoid this, minimum reliability/availability requirements that shall be specified. This open point will be solved by ERTMS/ETCS baseline 3. A specification for information purposes already exists.